Speaking of basketball, the World Basketball Festival tips off tomorrow afternoon in Times Square before moving uptown to Harlem's famous Rucker Park Friday and Saturday. There, the Brazilian and Puerto Rican national teams will hold open practices, followed by a scrimmage. Also on Friday afternoon is the Battle of Boroughs, a four-team tournament featuring the city's best high school players, followed by an exhibition between select high school All-Stars and their Chinese counterparts. 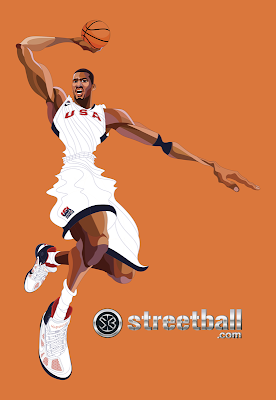 The festival's logo is currently pinned in my cubicle, next to this incredible illustration of Amar'e, which was designed by Streetball. Here's a complete index of their work. I can't decide which one I like the best. It's a toss up between Deron Williams and, oddly, Yi, the Big Red Machine, although there's a lot to be said about the Varjeo. Go figure.